“With the 13th pick in the 2012 NFL draft, the Arizona Cardinals select Michael Floyd, Wide Receiver, Notre Dame” – Rodger Goodell. 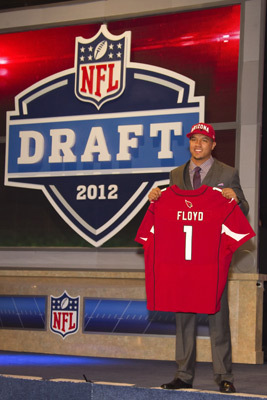 I am shocked that the Arizona Cardinals were able to pick up Michael Floyd (Pick 13) in this years NFL Draft. What an amazing pick up and great addition to the team! I thought that Arizona was going to end up with Melvin Ingram (Pick 18) to help with the defense. Or that Arizona would had bolstered up their O-Line with a pick up of Riley Reiff (Pick 23) or David DeCastro (Pick 24). But instead Arizona took the advice of Larry Fitzgerald and picked up a weapon, Floyd. With Floyd, both he and Fitzgerald will be able to stretch the field and at least help take some attention away from Fitzgerald. Floyd will also free up defenders from Early Doucet (669.8 yds, 5 TD), allowing him to make big time plays. As for Andre Roberts, his future is unknown. Arizona may have as many as 5 receivers on their team or they may trade Roberts for a low draft next year or for a veteran tackle/guard that is past their prime. I am so stoked that Floyd will be a part of the Arizona organization. Arizona had a lot of close games that they just couldn’t close out last season. They also have a decent list of opponents for this year. I am predicting, with great possibility, that Arizona will be making it into the post season and their chances for the Super Bowl looks probable. Watch out Niners, the Cardinals are back to take the NFC West Title!